A flavorful soup with a cheese toast floating in it – for me, this is the apex of comforting food on a rainy November day. This is a light, bright soup. The sweet yet slightly edgy taste of turnip goes well with the nutty but slightly edgy taste of arugula. (And the arugula helps to prevent turnip-soup-grey drabness!) And both combine nicely with the distinctive (and slightly edgy) taste of gorgonzola. I used half arugula/half baby spinach, hoping that the spinach would help to mellow its snappier cousin. I used a vegetable broth made with the carrots/potatoes/mushrooms/shallots/garlic & turnip greens. Plus a handful of masoor dal and a variety of herbs. If you’re not a fan of gorgonzola, you can make cheese toasts using a milder cheese, or no cheese at all, or leave them out altogether!! Danny Polo is a clarinetist from the 30s, and here he is Doing the Gorgonzola. In a large sauce pan warm the butter. As it starts to froth and brown, add the shallots, garlic, and herbs. Mix and then add the white wine. Stir it up and let it cook a few minutes, so that it reduces and becomes a bit syrupy. Add the turnips, and stir and cook until they’re coated, and then until they soften and begin to brown. Add the arugula/spinach, and cook until slightly wilted. Pour the broth over – it should cover the vegetables by about an inch. You can judge how thick you like your own soup. Cook for about 15-20 minutes until the turnip is soft, but still has a bit of texture. Add the vinegar and plenty of salt and pepper. For a smooth soup, purée the whole thing. For a chunky soup, leave it as it is. I like to purée half the soup, so that it’s velvety, but has some texture. Serve with a gorgonzola toast floating in the bowl! Slice a loaf of french bread or ciabatta into very slin pieces (1/4 – 1/3 inches thick). Toast until they’re just starting to brown. Make enough so that each person eating soup can have 2 or 3, depending on the diameter of your bread. Spread about a teaspoon of cheesiness on each toast, and then toast again, or place under a broiler, until the cheese is melted and starts to get bubbly and brown. You can leave some toasts plain (or brush with olive oil) and they’ll still make good croutons. Float in the soup of your choice!! 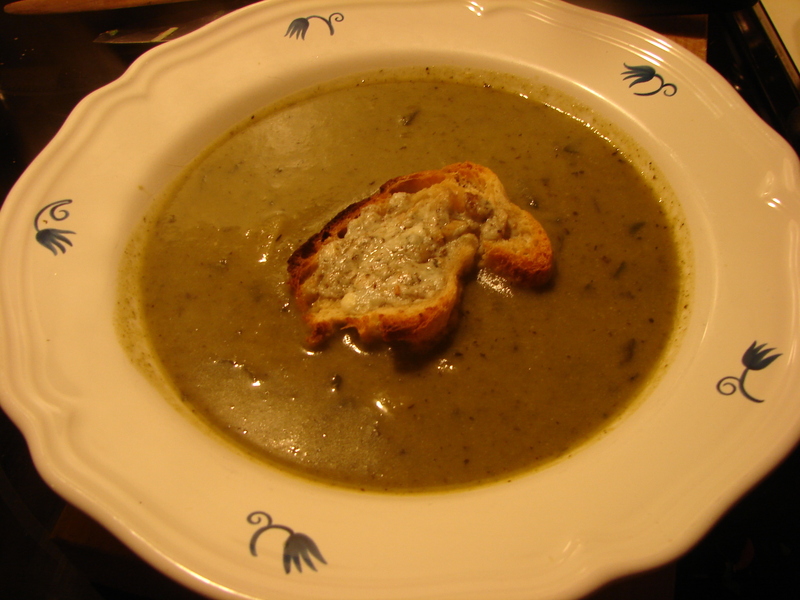 This entry was posted in recipe, soup and tagged arugula soup, gorgonzola toasts, light soup, turnip soup by Claire. Bookmark the permalink.